The Salerno Walnut Console Table is a simple but effective piece, perfect for making a style statement in previously unloved space. The warm walnut veneer gives this console a luxurious and elegant look but still adds that rich warmth that timber brings. The deep chamfer to the side keeps the profile of the table slim and streamlined while the mitred joints add interest and detail to the front. To finish the look, each of the four legs are tapered and faceted, creating an interesting, almost twisted optical illusion. 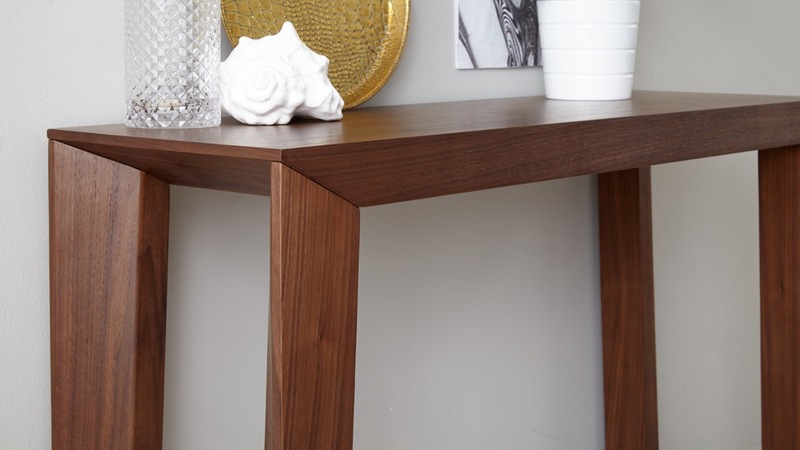 At the front of the Salerno console table you'll see the legs and table top each have neat mitre joints, which adds a touch of interest to the console's simple shape. This element of joinery detailing gives the Salerno a much more bespoke and well designed appearance. 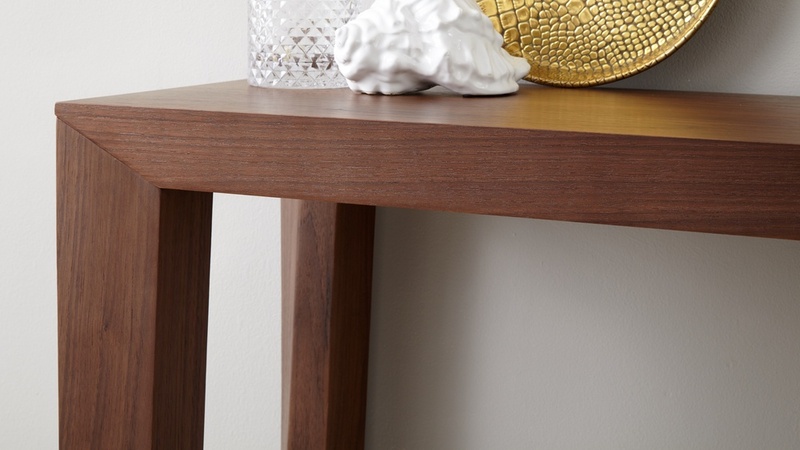 The advantage of the deep side chamfer is that it helps to keep the console table looking slim from the side. This such an important feature as a console table typically lives in a space where you don't have lots of room to pass by, like an alcove or hallway. 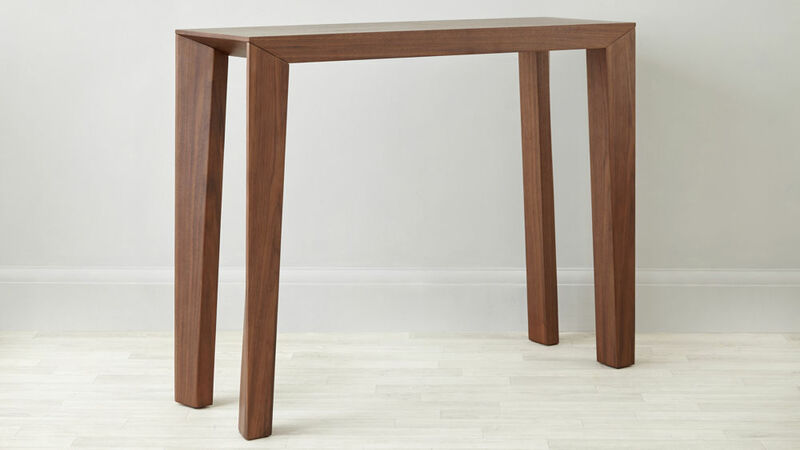 The legs of this modern console table are tapered on multiple sides, giving the optical illusion of a twisted leg. This not only keeps the table looking streamlined, but it's also a very interesting and unique design feature. 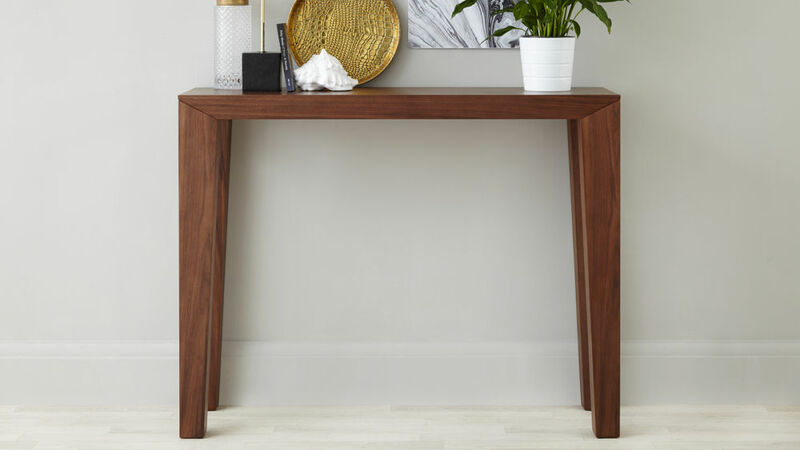 Measuring 85cm in height, 35cm in width and 110cm in length, the Salerno Walnut Gloss Console Table is big enough that you can style and store a variety of items of the surface, but streamlined enough that it won't take up lots of room. This makes it such a handy piece for busy homes or where space is at a premium. Having just one finish is a great style option as it really emphasises the consoles modern simplicity. The shape of this console gives it such a modern look, while the walnut finish adds a touch of warmth and such a homely feel. 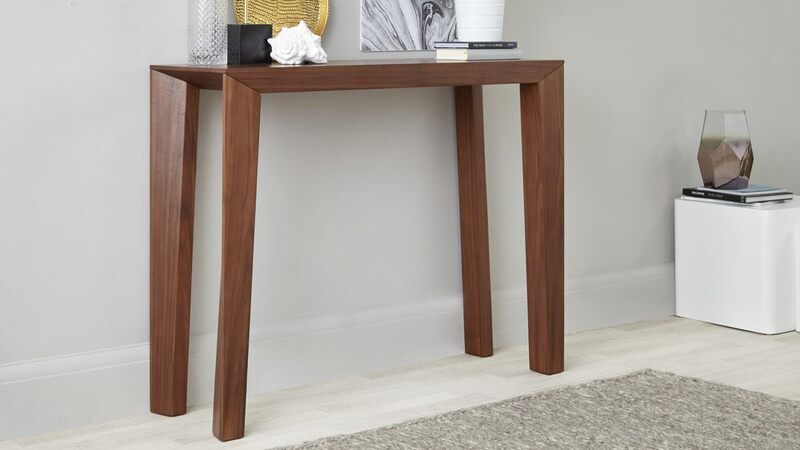 If you love the shape of the Salerno Walnut Console Table but are after a slightly different finish, we also have the Salerno Matt Grey Console Table and Salerno White Gloss Console Table available, all part of the Salerno console table range.